South Carolina’s Islander are back with their second full-length album Power Under Control. There are several new members, including guitarist J.R. Bareis (Love & Death), bassist Ezeziel Vasquez and drummer Arin Ilejay (ex-Avenged Sevenfold). 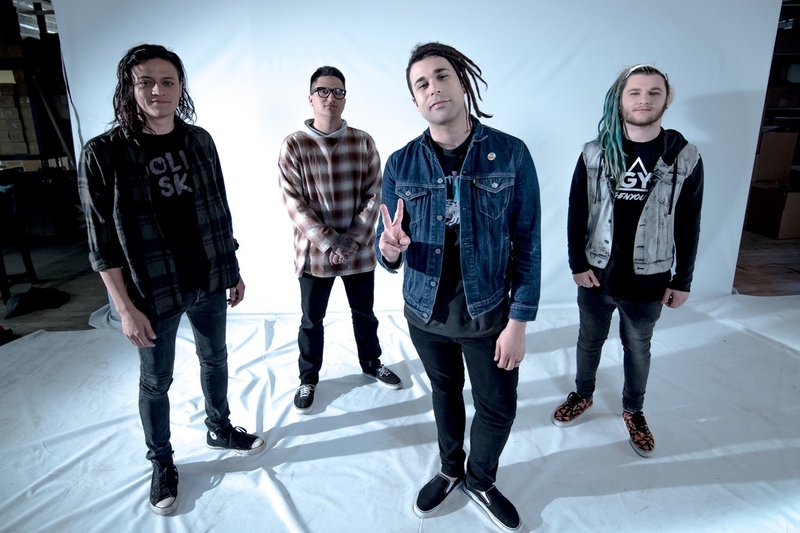 Frontman Mikey Carvajal and Ilejay get us up to speed on everything Islander. Chad Bowar: You’ve had a few lineup changes since Violence and Destruction was released. How did the new guys come to join the band? Mikey Carvajal: We were all friends from touring. I think that was the biggest difference from the previous lineup. It was a natural thing though, and it all just fell in place. Arin, what was the biggest personal adjustment for you when joining Islander, and what was the biggest musical adjustment? Arin Iljay: The mindset has been the biggest wake up call. I haven’t applied myself to many leadership positions, so joining Islander has called me into a balanced partnership/leadership role. Since childhood I’ve tended to take a back seat role, but this opportunity with Islander has really helped put to the test the different things I’ve learned over the years. The biggest musical adjustment has been learning how everyone performs on stage and developing a bond that continues to tighten over time. A lot of musicians can play almost any parts, but I believe it takes a special bond between a full band to really make the live experience magical. It’s been a real pleasure to share the stage with the guys thus far! How did the lineup changes impact the songwriting process for Power Under Control? Carvajal: I think it definitely allowed for more freedom to experiment. We all had a fresh excitement going into this record. We wrote all the songs in just a week and a half, so when we recorded them they still felt very new and fresh to us. That’s my favorite way to do it. It allows for the music to come across more inspired than so planned out. Did working with producer Cameron Webb again help provide some continuity after the changes? Carvajal: Absolutely. He is amazing to work with. He always says that he believes punk rock can change the world. He really believes in what he’s doing, so to throw him in the mix, you know you’re going to get someone real and honest. He never tried to change us. He just helps us be the best version of Islander that we can be. He’s the real deal. What will be your strongest memory of the recording of Power Under Control? Carvajal: I believe the friendship. Music made with friends sounds like music made by friends. How has the band’s sound evolved on this album? Carvajal: We would rather have the listener tell us. Mikey, what impact did HR from Bad Brains have on you when you were younger, and how was it to have him appear on your album? Carvajal: HR had not only an impact on me, but all heavy music. He doesn’t get enough credit. The dude is punk rock as they come. I grew up listening to Bad Brains on the way to and from school. This is the second song we’ve had him guest on, and I just can’t get over the magic that he brings to the table. It’s like he carries lightning in his heart and unleashes it into the microphone. What led you to crowdfund part of the cost of the album, and were you satisfied with the response? Carvajal: Actually, a fan set that up for us. She asked if it was okay for her to do so because she knew we were having trouble with finances and could barely afford the gas to get to California. Our fans are what keep us going. We were blown away by the response. I’m honestly not sure if we would have been able to continue being a band without her stepping in at the right time. It was meant to be. Now that you’ve been touring for a few years and building up a solid fan base, what are your expectations for Power Under Control? Carvajal: We never go into anything with good or bad expectations. We try to just take one day at a time and meet each person where they are. One heart at a time is how we change the world. First week sales numbers have become increasingly important. Is it frustrating that bands aren’t given the chance for a gradual build these days? Carvajal: Yeah. It’s sad. The industry is behind on a lot of that kind of stuff. It’s sad that they still count record sales knowing that even the most popular pop artists are having trouble selling records. Do you have a touring strategy mapped out for an album cycle as far as headlining vs opening vs festivals, etc., or is it completely reliant on what offers come in? Carvajal: A little of both. We look at everything as an opportunity and take one day at a time. What’s Islander’s level of awareness/popularity in Europe and other places overseas? Carvajal: We haven’t been there yet, but I do get tons of emails and Facebook messages weekly begging us to come. So looks like that’s in the cards soon, too. Arin, when you are playing Islander songs live that you didn’t record, do you try to stick closely to the original arrangements or do you change things up? Ilejay: I keep it as close to the original as possible, but after playing these songs for several months I couldn’t help but hear some little variations in fills and such that I felt could bring a little more to the live show. Describe the first time you heard an Islander song on the radio. Carvajal: I was in and out of sleep when we were on the Mayhem Festival tour. We were so exhausted we couldn’t remember if it was a dream or not when we woke up in the van the next day. Carvajal: Our fans. We are nothing without them. Literally.